Calvin Chen is one of the younger guys who entered the Adonis Index Contest. He placed 5th in the transformation class. Apart from Mike, who was interviewed last week and was focusing mostly on fat loss, Calvin needed to build muscle and that’s exactly what he did. 12 weeks is a very short period of time to build muscle. Calvin had the advantage of juvenile muscle growth. You can check it yourself, here are his before and after pictures. Calvin obviously put on some muscle. Just check out his arms and shoulders. Look at Calvin's back, this is a pretty big difference after just 12 weeks. It’s obvious that Calvin has built bigger shoulders, this is because Adonis Index Workouts are focused on building upper body width. Calvin is a college student, so he doesn’t have much of a training background yet. Before he found the Adonis Index, he started like most young guys. He was lifting some dumbbells at home, he didn’t have any good program to follow, he did everything just learning from fitness magazines. 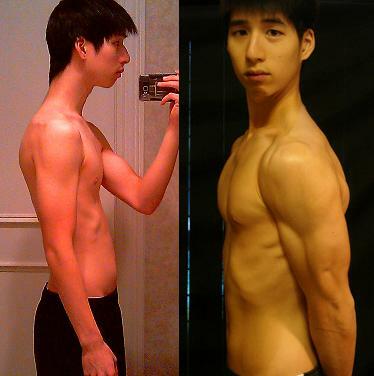 He trained only his bicep, triceps and chest. This is probably one of the most common mistakes – not having a proper workout program to follow. If you look around yourself in the gym, you will see that most of the guys don’t look that good and don’t have a quality plan at all. Obviously this training is good only if you want to lift something…anything, but if you want to actually see any change in muscle mass, you have to take a different approach. If the purpose is to look better, it should focus more on your shoulders and back rather than arms and legs. 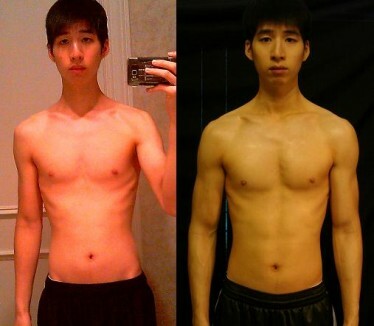 During the 12 weeks Calvin did the most difficult task – build muscle. It’s easy to strip off the fat in 12 weeks, but to build muscle? Not so much. Usually you will see only little change in muscle growth in such a short period of time. Building muscles takes years of dedicated training. Calvin’s advantage was through his juvenile muscle growth. If you are his age (19) and you are not yet working out, you should start as soon as possible, because this is when you can get the best gains. This is as close to a steroid effect as you can naturally get. A lot of older guys beat themselves up, because they started late, the difference in the possible physique if you start young is huge. Nowadays almost every guy is obsessed with protein intake. It seems that we are so affected by advertisements that we feel something Brad Pilon calls protein guilt. It’s really hard to avoid this. Most of the guys try to eat as much meat, eggs and protein foods as possible and supplement it with protein shakes on top of that. But is this really necessary? Calvin views protein intake differently. He was following Pilon’s advice from the book How Much Protein. He didn’t watch or track his protein intake, the only thing he knew exactly is that he took 52 grams of protein powder each day and that’s it. Based on his diet, his protein intake was around 80-100 grams, which goes against the conventional wisdom of eating 150-200 grams a day to build muscle. Calvin didn’t even worry about calorie intake. To prevent from gaining fat, he was eating mostly fruits and vegetables and regularly fasting. Not exactly something you would find in a fitness magazine. And all this obviously worked for him. He gained several pounds of muscle, and is no longer called skinny and is definitely on the right track. How fast can I expect my muscles to grow? How would I know if I plateaued on muscle growth? How many years I have before muscle growth slows down? If you don’t eat enough protein what will happen to the muscle? How can weight training help my body become more efficient at protein consumption? Do I have to count calories every day?